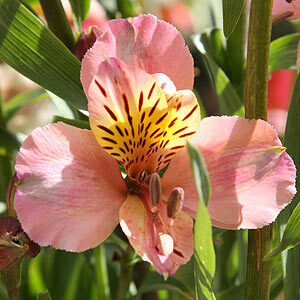 Long flowering plants are much sought after and alstroemeria are one such plant. With wonderful new cultivars becoming available the color range is fantastic, from pure white through to deep reds with yellow and orange along the way. How good are these plants, widely grown as cut flowers alstroemeria grow well as in the garden as well as in containers. Sometimes called 'Peruvian Lily' or 'Lily of the Incas' they are available for sale as a rhizome or bulb when dormant or as potted plants, they may also be grown from seed. New alstroemeria cultivars such as 'perfect blue' seem to have longer lasting flowers than some of the older plants and are readily available for sale online. Remember to avoid frosts, try mulching well to prevent frost damage. 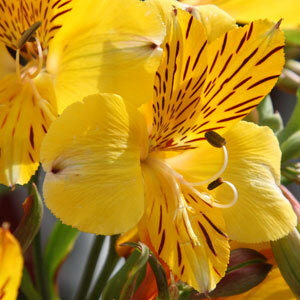 Alstroemeria plants and bulbs are also found at plant fairs with some interesting varieties. Alstroemeria flowers make great cut flowers, especially the taller growing varieties. So why are these 'easy care', long flowering', 'colourful' plants that make great cut flowers not all the rage with gardeners ? Simply because they are so easy is one reason, secondly some gardeners have found that they tend to 'take over', they spread through the underground tubers, and some of the older types will self seed. This is more of an issue with species such as Alstroemeria pulchella than most of the flowing types available for sale. Many of the new cultivars are lower growing to around 60cm. Others will reach 120cm with ease. Look for the modern hybrids that do not self seed. These are a drought tolerant plant that requires good drainage. They will survive without watering in most UK summers. Best grown in a raised garden bed for drainage, or perhaps in a container. Planting depth can be around 10 cm, however in areas where you get heavy frosts plant them at 15 - 20 cm deep. This will stop them from suffering in the cold. Cultivation requires a well drained soil moist humus rich soil in a sunny position. Water during dry spells and fertilise with a liquid fertiliser for best results. Plants can be grown in pots in cooler areas and over wintered indoors to avoid frosts and extreme cold. Many growers mulch alstroemeria during winter if left in the garden, this helps prevent frost damage. In very dry summers Alstroemeria can go dormant during summer. After flower ing the long stems can be progressively cut right back to promote more flowers. As they die back in winter they can be pruned back to the ground. Alstroemeria can be grown from seed planted in a cold frame. They will not grow from cuttings, however it is very easy to divide established clumps, simply dig them up in late winter, cut up the clump of roots and tubers, divide and replant. You will need to give them some water, with a little added liquid seaweed or vermicast tea.